Well, Jeff, for the next 10 posts, I’ll answer your question. 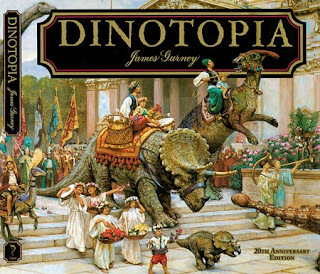 Although the illustrated book Dinotopia: A Land Apart from Time was published nearly 20 years ago, let me go back even further tell you about how I found my way to the idea of an island shared by humans and dinosaurs. As a kid, I spent a lot of time sketching animals and building kites and gliders. I liked dinosaurs, but no more than any other kid did. My father was a mechanical engineer who told me that you can build anything you dream about, but you have to start by drawing it. 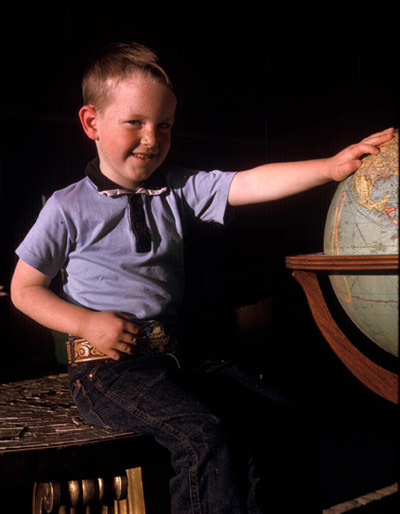 My daydreams revolved around adventure stories and ancient civilizations. Outside my bedroom door was a shelf of very old National Geographic magazines. When the rest of my family was sleeping, I tiptoed into the hallway, pulled a volume off the shelf, and read about biplane pilots flying over uncharted Inca ruins. 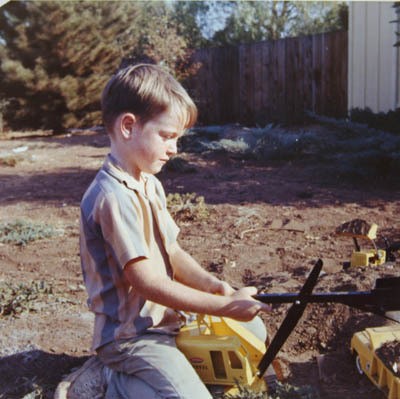 I dug pits in my suburban front yard in northern California, hoping to find a bone or a button. Parents in my neighborhood banned their kids from playing at my house because they always came home with their pockets full of dirt. I always loved to draw, but got more serious about it when I took a class in graphic arts and illustration in junior high school. At the same time I discovered art instruction books. After reading Norman Rockwell, Illustrator , I did this pen and ink drawing from observation of a rocking chair when I was 13 years old. I'm always impressed with your art, but I gotta tell ya that rocking chair ROCKS. Thanks, Vicki! 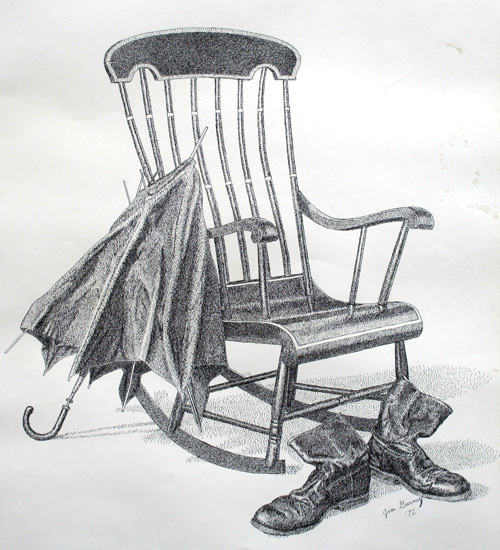 I had the chair, umbrella, and boots set up in a spare bedroom for quite a few days while I did the drawing. It's crosshatched with a very fine technical pen. Lots of patience to do that chair! Or lots of fun doing it. That's one cool story. I hope we can raise my nephew in a similar way. I bet your parents increased your insurance policy after they saw that drawing. Michael, not really. I had that drawing up for sale for $20 at our middle school's craft show, and my art teacher told me not to sell it. He said I might want to have it some day. Thanks, Mr. Kinnear! I'm a high school art teacher with really advanced students, some of who have been taking drawing and painting for 4 years. They're great, but seeing that chair is the kind of thing that makes them despair of ever attaining a skill like yours. They say: "he was obviously a Mozart-like visual prodigy, you can't make a Mozart, they're born." (Yes, they really talk like that.) I admit that it's true, but assure them that it's still worthwhile to pursue artmaking if it brings them joy, and that as long as they're doing the best they can, and challenging themselves, they should still be proud of whatever they accomplish. I want to structure the next few assignments around the gamut masking technique you use, but I simply cannot locate published pads of YURMBY wheels anywhere on the internet! Where do you get them? Wow! Great post, really looking forward to this series about the origins of Dinotopia. Jeremy, about the Yurmby wheel, there are a couple of digital versions you can print out on a good color printer. If you go to this G.J. post called Gamut Masking Followup. It was made by Alex Castillo (Thanks, Alex!). Or you can download and print out the one I've been using. I think it's even better if your students have the time to go through the process of painting their own wheel in oil or gouache. It's good color mixing practice, and then the student ends up with one to keep. About the rocking chair drawing, I believe that the skills behind a drawing like that are something that can be taught to anyone at any age, and I've seen academies where they take people off the street who learn the knack of it in a few months. I was almost entirely self-taught in drawing. If it's any comfort to your students, I couldn't crack the code of how to paint until I was in my 20s (and I doubted until then that I could ever be a real artist). But I believe painting can be taught too--I just had to figure it out for myself at the time. I wasn't so lucky as to have a teacher like you. When I was thirteen years old, I just learned that eyeballs do not rest on the forehead. Incredible what you did with that chair. That was an interesting post. Thanks for sharing a little insight to to your youth and artistic interests. I look forward to more of these posts. James, thanks for the words of support and the YUMBY wheel!